SoulCalibur VI is undoubtedly one of the finest fighting games of this generation, and one worth exploring even if you can't get into the broader genre. I may not be the dedicated fighting genre expert here at DualShockers, but within the last few years I’ve certainly opened up my range. Most recently I spent dozens of hours nearly platinum-ing SNK Heroines: Tag Team Frenzy and I got lost in my review of Tekken 7, a game I maintain is a return to form for the series. However, Project Soul’s SoulCalibur VI is without a doubt the most exceptional fighting game of this generation thanks to rock-solid gameplay mechanics, a compelling single-player mode, and consistently steady online performance to support every type of player. If you’ve never played a SoulCalibur game in the past, you are surely missing out. Acting as a fusion of fighting game with old-school RPG elements in select locations, the game manages to equally serve two different audiences: single-player lovers and online matchmaking junkies. The more “standard” campaign mode is Soul Chronicle which continues the story of the Soul Edge, following series-favorite characters as they work to obtain, destroy, or hide the Soul Edge away. 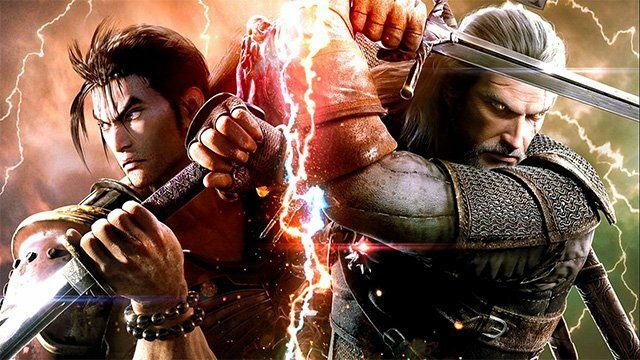 Though many games like Tekken 7 or the Injustice series will opt for a chronological story, SoulCalibur VI plays with the formula interestingly. Given you the timeline (seen below) you can follow the events of the story from different characters perspectives in whatever order you prefer. Each episode will generally have a corresponding fight. Are you someone who wants to approach the game sequentially across all characters? You can take that option. Would you rather just follow the main plot, then take each character chronologically? You can do that as well. The result is a campaign that plays off itself well, with fates intertwining and characters bouncing in and out of sections — all while creating relevant backdrops for other character arcs. Sure, the story isn’t going to be winning any Oscars with some characters having far more compelling than others–watching Grøh struggle with becoming an abomination that he has sworn to kill is infinitely more exciting than watching Maxi defend a dock through multiple episodes. But even still, I kept pushing forward to see how each story would progress. Meanwhile, the Libra of Soul gives you the ability to create your own character and take part in the Evil Seed yourself. Tasked with removing Astral Fissures from the world that are corrupting the minds of otherwise peaceful citizens, you will bounce around different environments meeting characters, taking up side missions, purchasing equipment, and upgrading your character. This mode isn’t necessarily new to the SoulCalibur franchise, as it is a perfection of what previous entries have done. In many ways, the narrative feels like it is delivered in a similar tone as old school, text-based Multi-User Dungeon games with battles customized battles thrown into the mix. Not every side quest is compelling, but I never felt unrewarded for picking them up. Even better, the gameplay during the Libra of Soul mode has more variety than just the occasional difficulty spike. Each time you take up a new battle, there will be customizations that follow. For instance, one may play with a normal stage with three low-powered thugs. However, the next battle may be against an overpowered Ruffian who can only be finished off with a Critical Edge attack. Another one may have you and opponents sliding around the battlefield with low friction and a high chance of falling outside the ring. In short, the game never feels stale when you are playing from story beat to story beat. 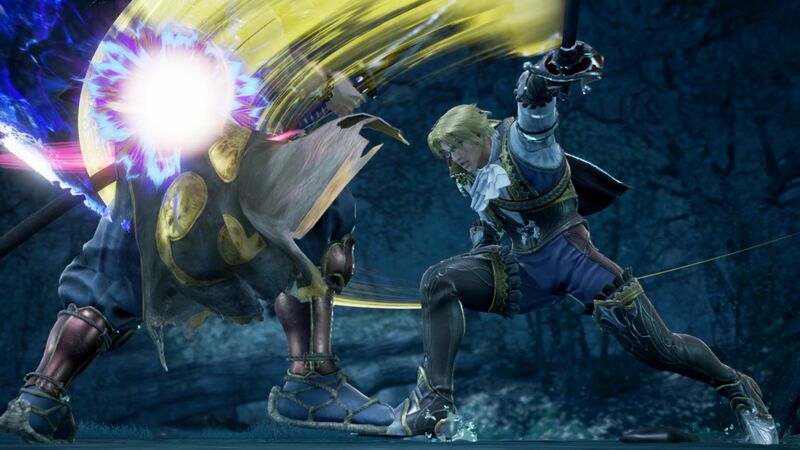 Take all of that and add on a mix of world building, gameplay customization through weapons, and fine-tuning equipment and Libra of Soul is easily SoulCalibur VI‘s premier mode. I can easily see myself going into this mode for a second and third playthrough using different builds and maintaining a different personality–which, mind you, affects the story. There are definitely things that I wish were changed with the delivery of the story; as you can imagine, some of the voice acting is very mediocre–any given NPC will sound like they are from a 90’s cartoon. The load times are never very long (about 15 seconds), but they tend to add up after nearly every fight. Additionally, the bulk of the story is told via concept art-like semi-dynamic backdrops. This latter issue didn’t bother me, so much I felt the story often felt less dynamic than if Project Soul invested in animating these scenes. However, I would much prefer developers work on creating interesting and novel delivery via gameplay — which SoulCalibur VI brings in spades — over-polishing on presentation. To take a detour away from the game modes, let’s address the gameplay itself–SoulCalibur VI plays excellently. While I doubt anyone can truly be a judge of balance in the first few days of a game’s release, so I won’t comment on that. What I will say is I haven’t noticed in my online matchups that anyone is absurdly unbalanced one way or the other. Weapons based fighting games are going to appeal to some people over others, and my guess is you already know who you are. I’m personally a fan of the customization in gameplay style it brings to the table, but there will be more deviation in gameplay away from your more traditional fighting series like Street Fighter or Tekken. However, if you are a person that enjoys the flexibility of movement speed and range of attacks, SoulCalibur VI will feel right at home. Speaking to both newcomers to the series and veterans, Reversal Edge really brings the more competitive fights to a new place. One of the common complaints in SoulCalibur V was limitations when it came to guarding attacks. Through the Reversal Edge, you will now have a way to counterattack while staying in guard, bolstering your defense options. I imagine this was an addition to allow for accessibility and to quell concerns in the fighting community when it comes to balance. One aspect that will likely be undersold in both the marketing and most reviews is the ability to customize your own character via a generous character creation mode. 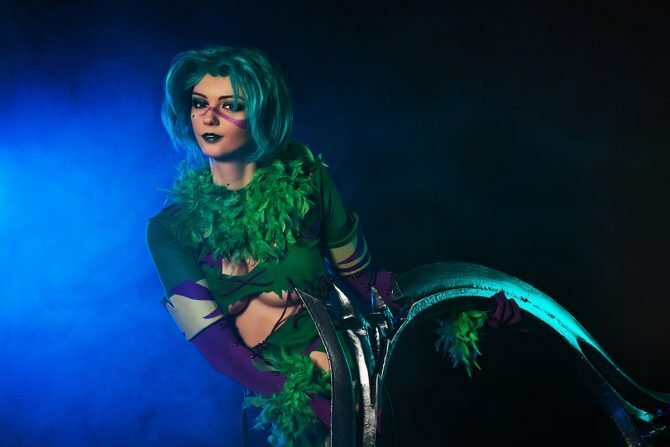 Between race customization and being able to alter everything from clothes to bust to eye color, you can get lost in creating your own character–especially when you stray into more jokey categories. 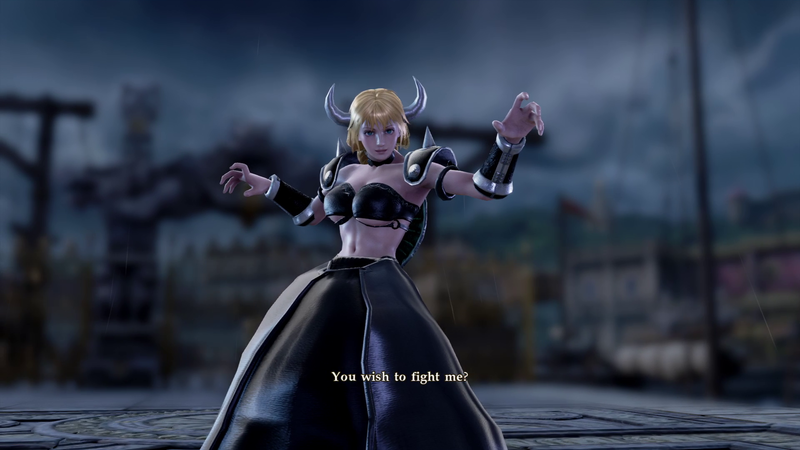 While I thought I was the only one having fun with this by making a berserker-themed Shrek to take down online opponents, my first ranked enemy was–get this–Bowsette. And a reasonably believable looking one at that, shell and everything! I’m actually looking forward to online matchmaking now, only to see what crazy customization people have been able to tap into. Speaking of online matchmaking, the pre-release review servers certainly had a strong netcode and very minimal (if any) lag. 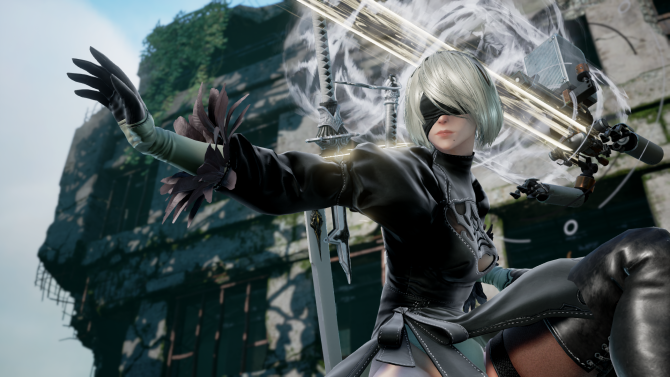 There is no guarantee of the game’s performance online until it is stress-tested by every Day 1 buyer, but of fighting games that I have reviewed ahead of launch, SoulCalibur VI is the most consistently stable online. Moving back to Modes, the Online and traditional modes will scratch the usual itches without raising an eyebrow. 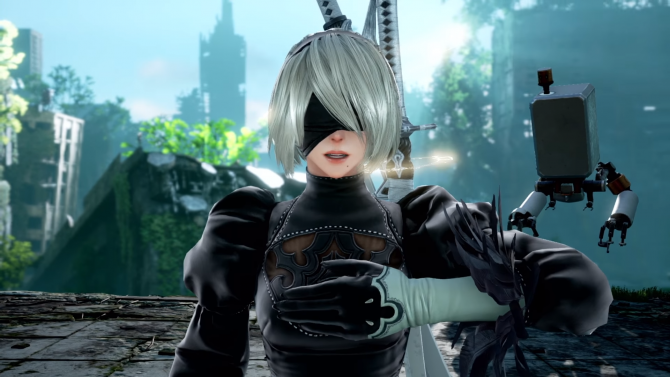 Speaking for Offline modes, players will have the option of Training, Versus, and Arcade mode that play out as they do in every fighting game ever. Similarly, Online consists of ranked and casual play. While SoulCalibur VI could likely benefit from the addition of more novel modes online, I’m more than satisfied with their offline campaign offerings. Worth noting is the inclusion of Geralt of Rivia, The Witcher series’ iconic protagonist. As far as previous crossovers are concerned, Geralt fits in more than most thanks to the wealth of magic and sword fighting within his own game — however, he is still far from my favorite to play as, in a personal preference. SoulCalibur VI does a lot of things, but I think its most lauded achievement is providing a game that will appeal to almost anyone on the gaming spectrum; whether you consider yourself an offline or online gamer, an RPG lover or fighting game fan. And, even better, each component is executed expertly, demonstrating the apparent talent of Project Soul and why it’s taken over half a decade for another mainline release. SoulCalibur VI is undoubtedly one of the finest fighting games of this generation, and one worth exploring even if you can’t get into the broader fighting genre. With rich and complex campaign modes and robust gameplay, SoulCalibur VI is a game I will return to for years to come.